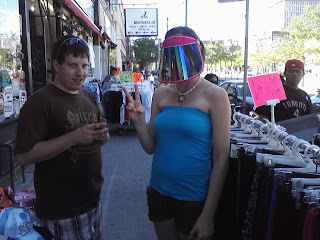 Matt, Esther and I enjoyed the civic holiday on Monday downtown exploring Kensington market. I do not have pictures because we were too busy enjoying our day! We wandered and window shopped in Kensington, had Mexican food for dinner, and spent the evening down at the water front. We sat on the boardwalk with our feet in the water and watched boats, and there was a really funny busker. It was a gorgeous day, and we wore sunscreen, so no regrets! UPDATE: I found this picture on my phone. 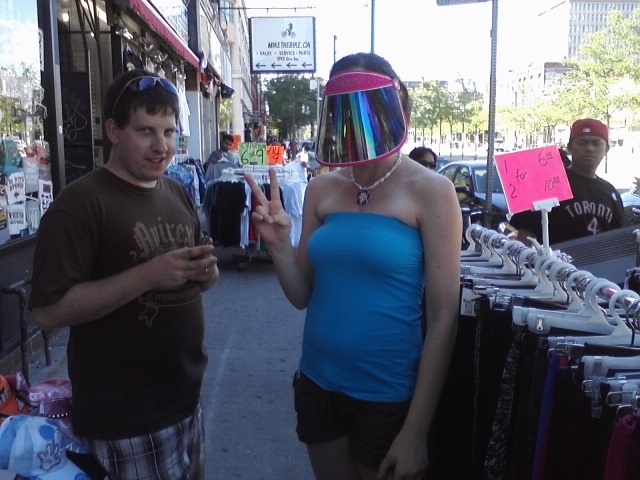 How could I forget the sun visor/welding mask Esther stubbornly refused to buy? lol...she can be stubborn, it's true. Can't believe she could leave a visor like that there!